A response to recent concerns. Friends of mine have asked me to write some details about my life, partly to clarify information which appears online or in the press about me as my teachings become more prominent around the world, and partly because one of my Tibetan lamas has asked some of my students to write a biography about myself. These friends have been pestering me for some years—but I felt hesitant to respond, since it seemed a pretty self-centered thing to do. But as it may be helpful to my students and friends, I have decided to relent. What I thought to do is write a series of essays on different topics of my life and teachings which could be posted publicly and updated from time to time. I will try to organize these essays by subject, and put them in a question-and-answer format, based on interviews that I’ve given in recent years in North and South America. Here is the first of these essays. Please describe your training as a geshe. The word geshe in Tibetan literally means “spiritual friend.” It was used informally for teachers in the early history of Buddhism in Tibet, about a thousand years ago. 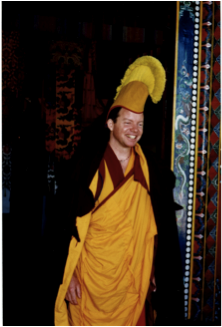 In the past 500 years or so it has become, in one of the Tibetan traditions, a title for a religious scholar, sort of a “Master of Buddhism.” Here is the story of how I became a geshe. I had been preparing for a career as a priest in the Episcopal ministry, and had already chosen Episcopal Theological School in Boston. But the news of my mother shook me deeply, and I requested a one-year sabbatical in order to go to India and seek some answers. I had already taken a course in Buddhism from Prof. William LaFleur, a specialist in medieval Japanese Buddhist poetry who in time became a dear friend and lifelong mentor. I was deeply affected by this course, and thought that the Buddhists in India might be able to help me. Only after arriving in India, alone, did I learn that Buddhism had died out there almost a thousand years before! I was told though that there were monks coming out among the tens of thousands of refugees from Tibet; that they were living in the small towns in the foothills of the Himalayas, and perhaps could help me. I traveled north in the fall of 1973, pausing for about a month in an Indian ashram in Hardwar, where I received my first meditation instruction. In time I reached the Himalayan hill station of Mussoorie; I made my first contact with Tibetan refugee monks here, and in the nearby Sakya monastery at Rajpur, near Dehra Dun. I stayed for several months in Mussoorie, learned my first basic Tibetan words and ideas there. At this time I also began intensive studies in Indian classical music—sitar and tabla—with Shri Mubarak Masih, a master from the Persian tradition. I slept in a sleeping bag on the concrete floor of a small, unheated Christian church; and I remember spending my 21st birthday there alone on a particularly cold day, and hearing that poor people in the village had died from the cold during those weeks. I returned home and spent some time helping my mother; and then with Prof. LaFleur’s help I applied for a grant from the Woodrow Wilson School, one of the world’s leading institutions of political studies, in order to continue my work among Tibetan refugees. I was awarded the McConnell Scholarship Prize and returned to India in the summer of 1974; Princeton also agreed to offer me the following semester abroad, under a scholarship. This time I went straight to the Library of Tibetan Works & Archives in Dharamsala, a small Himalayan hill town where His Holiness the Dalai Lama and his teachers were also staying. I began formal studies of Tibetan language and philosophy under Geshe Ngawang Dhargye, and two extraordinary young incarnate lamas who were his translators at the time. I was trained primarily in two texts: the Jewel Ornament of Liberation, written by Master Gampopa (1079-1153), a disciple of the famed Milarepa; and the Guide to the Bodhisattva’s Way of Life, by Master Shantideva (8th Century). The latter includes a masterful chapter on the Buddhist concept of emptiness, and this was my first exposure to this precious treasure. Ironically, I was able to get an Indian visa for my extended stay only because I had studied classical music, and could enroll in a local music school under the direction of Shri Desh Bandhu Sharma, with whom I later played several concerts for Indian audiences. In the meantime, my mother’s condition had deteriorated to the point where the cancer had reached her brain, and she was having frequent epileptic seizures. I sought the advice of my lamas, who urged me to invite her to India. She could be treated by a famous Tibetan doctor, Yeshi Dhonden, who was also personal physician to His Holiness the Dalai Lama. And she could study ideas with the lamas that would help her in her illness, or after death should she pass away. I wrote my mother and she did make the difficult journey. She took treatments of Tibetan medicine, and we propped her up in Geshe Dhargye’s classroom to learn of life and the passage after death. At one point my teachers arranged a very emotional private meeting between her, myself, and His Holiness. We talked about whether I should return with my mother to the US, to help her and complete my university studies; he said yes. I had heard about a lama living not far from Princeton, Geshe Lobsang Tharchin (1921-2004, later known as Khen Rinpoche), and asked whether it would be good to study with him. His Holiness enthusiastically approved. I returned to university in the winter of 1974, and was offered a room in the Episcopal parish house by the minister and his wife, close friends. I began commuting to Khen Rinpoche’s classes, again studying Master Shantideva; the “Steps on the Path” or lam-rim of Pabongka Rinpoche (1878-1941, teacher of the teacher of the current Dalai Lama); and the traditional textbooks of Sera Mey Monastery, which is the monastery in where Pabongka Rinpoche himself was trained. During this time I also devoted myself to independent studies of Master Shantideva in Russian translation, under Prof. Ellen Chances of Princeton’s Department of Slavic Languages. There were relevant manuscripts at the Roerich Museum in New York, and I also commuted there to work on them weekly. In the summer of 1975, I graduated from Princeton and on the same day moved to Khen Rinpoche’s residence at Rashi Gempil Ling. This is a small Buddhist monastery and temple located in a community of Mongolian-Americans in central New Jersey. These particular people were called the Kalmyks, long-time residents of the Russian steppes who had immigrated to the US after World War II. Mongolians have been followers of Tibetan Buddhism since the 1200’s; His Holiness had appointed Khen Rinpoche the abbot of their monastery, and parish priest of the community. I lived here personally with Khen Rinpoche for 25 years, as his student and assistant. He was one of the last great geshes of old Tibet, having completed the hlarampa (this is the correct phonetic of this word, often misspelled) or highest rank of geshe, with angi dangpo—highest honors, a very rare achievement in Tibet which put him in the top ten or so of all geshes graduating that year from the tens of thousands of monks in the Gelukpa tradition of Tibet. He was a fierce debater and a very demanding taskmaster—and also incredibly loving and caring of all of us who had the honor of being his students. 1) Perfection of Wisdom (Prajna Paramita), presenting the ideas of the Madhyamika Svatantrika School of ancient Buddhism: covered primarily from the standard textbook of Sera Mey, An Analysis of the Perfection of Wisdom, an 8-volume work by Kedrup Tenpa Dargye (1493-1568). This is based on the Ornament of Realizations of Master Asanga (4th century), which I memorized in its entirety (and in the 25 years since have mostly forgotten). 2) Middle Way (Madhyamika), philosophy of the Madhyamika Prasangika School, primarily from An Overview of the Middle Way, also by Kedrup Tenpa Dargye. This is of course a commentary upon theIllumination of the True Intent, perhaps the greatest book ever written on the subject of emptiness, by Je Tsongkapa (1357-1419), the teacher of the First Dalai Lama. All are based upon Entering the Middle Way, by Master Chandrakirti (7th century). Khen Rinpoche for years also took us carefully through Master Shantideva’s Guide to the Bodhisattva’s Way of Life(8th century), which is from this same school. 3) Higher Knowledge (Abhidharma), philosophy of the Vaibhashika School, from both the Light on the Path to Freedom of His Holiness the First Dalai Lama, Gendun Drup (1391-1474), and the famed Higher Knowledge of Chim, composed by Chim Jampay Yang (c. 1280). Khen Rinpoche and I spent many years privately on studying and translating the former, in 400 pages, and in fact presented a copy of the translation to His Holiness the Dalai Lama during his first trip to the US (he was very pleased). 4) Logic and Perceptual Theory (Pramana), philosophy of the Sautrantika School based on the root text of Master Dharmakirti from the 7th century, which I learned primarily from the Collected Topics of Yongdzin Purbuchok Jampa Tsultrim Gyatso (1825-1901), and the (other) Light on the Path to Freedom, by Gyaltsab Je Darma Rinchen (1364-1432), which is the classic commentary on this subject used in intermonastic debates. I was fortunate enough as well to be taken through the Collected Topics of the Son, written by Ngawang Trashi (1678-1738, spiritual son of the great Jamyang Shepay Dorje)—an extraordinary text on this subject from the Gomang College of Drepung Monastery—by hlarampa geshe Ngawang Kelden. I was also the main author of a sourcebook called The Logic and Debate Tradition of India, Tibet, and Mongolia and printed under a grant from the National Endowment for the Humanities. This was a bilingual English/Tibetan volume including important texts and translations on this part of the geshe program, and included the most comprehensive bibliography of ancient logic and debate texts ever assembled at the time. We went on to teach the book and the basics of traditional debating to Kalmyk children in our community, under an NEH Youth Grant and with the cooperation of the local elementary school. This was selected the Youth Grant of the Year for 1979. 5) Vowed Morality (Vinaya), ethical philosophy of the Vaibhashika School; Khen Rinpoche took me through the entire section on the vows of a monk from the most famous Tibetan commentary of all time on this subject—The Commentary of Tso, by Kunkyen Tsonawa Sherab Gyatso (c. 1250). I also memorized Je Tsongkapa’s short summary, which we recited together every two weeks for many years, along with the entire sojong confession ceremony, also memorized. I also compiled a traditional presentation of all the elements of this complex ceremony in Tibetan, and this can be found in the ACIP textual database at catalog #S00216. 6) Steps of the Path to Enlightenment (Lam-Rim). Khen Rinpoche over a period of more than 20 years also took us carefullythrough what I consider the greatest text of this genre, and in my opinion the greatest spiritual book ever written, the 800-page Gift of Liberation, Thrust into Our Hands, by Pabongka Rinpoche Dechen Nyingpo (1878-1941). He repeated the entire text at his center in Washington, DC, and because I was his driver for these trips I also heard the complete transmission from him another time. After I had studied for several years at the Rashi Gempil Ling monastery, I began to make the trip to Princeton University several times a week to audit the Sanskrit classes of Prof. Samuel Atkins, chairman of Princeton’s Department of Classics and a renowned scholar of Greek and Vedic Sanskrit. I continued these classes until Prof. Atkin’s retirement, and then began private studies with him, which continued for years. We became very close, and when he passed away in 2002 his wife informed me that he had bequeathed me his entire collection of rare Sanskrit texts on the Vedas. The study of Sanskrit, the language of the original sutras and commentaries of Buddhism, is not a subject in the geshe course and is not taught in the monasteries of the tradition of the Dalai Lamas, but I think it has been a valuable part of my own geshe studies and subsequent translation work. During the first six years of my studies at Rashi Gempil Ling I almost never left the monastery, except to do Khen Rinpoche’s local shopping and laundry, and before I took formal vows observed the same code as the older monks there—which were about 10 ancient Mongolians and Tibetans, including over time, with Rinpoche, four hlarampa geshes who helped me in studies and debating. In 1981, Khen Rinpoche asked me to go to work to help support the refugees in India; and in 1983 he granted me monk’s vows. The ceremony was held at the reconstructed Sera Mey Tibetan Monastery in south India. This was my first visit to the monastery, which had been founded by survivors from the destruction of the original monastery in Tibet. Rinpoche insisted that I wear a business suit until my ordination day, which was pretty incongruous in the mud and heat of what was at that time a refugee camp. The monks checked my level of study after the first eight years with Rinpoche, and gave me some credit for my 16 years of western education (which actually did give me a solid foundation for my monastic education). For my first day on the debate ground, still in the suit, they placed me with the 12th-year class, debating Middle Way philosophy. I had spoken colloquial Tibetan much of the day for nine years—my education began at the Tibetan Library under a highly educated nobleman named Marlam Changdzu (whose son is one of the greatest linguists of Tibetan history, and trained me later in Tibetan and western linguistics); and at the Library I had helped edit a ground-breaking textbook on colloquial Tibetan by Gen Ngodup, who coincidentally had been trained by Khen Rinpoche. In later years I was trained in colloquial for many years by the former Debate Master of Sera Mey. Regardless, I was on that first night completely overwhelmed. I went back to my little monk’s room and gave it some hard thought, and the next day made a brave decision: I approached the monastery and asked if I could start my education all over again from near the bottom, with kids who barely stood shoulder height to me. 1) I redid much of the Perfection of Wisdom (lower Madhyamika) with an abbot of Sera Mey, and with a hlarampa geshe whom I consider the best teacher of Buddhist philosophy in the world, debating with my class. There is an important side subject here which is called the “Art of Interpretation”—how to interpret statements made historically by Lord Buddha which seem to contradict other statements he had made; in essence, a study of why the four great ancient schools of Indian Buddhism seem to contradict each other. This section might take an additional six months in the geshe program, and my class was directed to bypass it. This is because, towards the end of the geshe program, so few monks are left in each class that it becomes difficult to continue meaningful daily debates: you know what everyone else knows and doesn’t know, so no surprises are possible. So every other class will at some point be promoted to the next class up, thereby missing a number of important subjects. But I didn’t want to miss out on this crucial topic, so after receiving my geshe degree I asked my principal scripture teacher if we could continue through this subject, based on The Essence of Eloquence, on the Art of Interpretation—the main textbook, from Je Tsongkapa. In the late 90s I made two extra journeys to India to complete this subject, especially the section on the remaining school of the great four of ancient India: the Mind-Only (Chittamatra). Again, I was the only student in my class to complete this topic in this way. 2) For Middle Way (higher Madhyamika) I asked this same teacher if he could take our entire class through the original work by Je Tsongkapa—The Illumination of the True Intent—which would require an extra five years. He agreed, but the extra workload was too much for all of my classmates. We continued on alone together after hours, for many years, and completed the text. This was a very important transmission, and I tried to capture it all on a tape recorder; it would be nice to try to digitize these classes from the tapes, for those who might like to hear an entire explanation in wonderful Tibetan. 3) For Higher Knowledge (Abhidharma), I attended some of the debate classes on this subject but soon realized that I wouldn’t learn anything new that I hadn’t covered already in many years of private instruction from Khen Rinpoche, so I went on to other subjects. For two or three months out of every year then, in the winter, student monks at the six colleges of the Big Three monasteries (Sera, Drepung, and Ganden) study and debate this subject furiously in their own monasteries. Each monastery then handpicks about 50 monks as a team to compete in the Winter Debates against teams from the other monasteries—sort of a Debate Olympics. The teams compete then for many hours a day—and sometimes all night—for a month straight in the host monastery, which rotates every year. In my day it was considered an honor to participate on the team for one or two Winter Debates. I participated in an almost unprecedented four: one each at Ganden and Drepung, and two at Sera. So I learned this particular subject quite well. I was coached for my first Winter Debates starting from 1989, by a monk who is now one of the great six abbots, and by another geshe from Nechung Monastery, as well as by a former chanting master of Sera Mey. 5) For Vowed Morality (Vinaya), I continued studies with a former abbot of the monastery who is generally considered the greatest master of this subject in modern times, and with another hlarampa geshe and former debate master of the monastery. This literature is the most ancient in Tibet though, and I felt that many things had been lost and required further research.So during the period from 2004 to 2009 I undertook a deep research of the subject, teaching it to one of the professors at our university in the U.S.
We concentrated on the The Wish-Giving Jewel, a presentation by Choney Lama Drakpa Shedrup (1675-1748), an important textbook writer from our monastery whose works had been missing until they were located by my ACIP research team among ancient manuscripts in the library of the Russian Academy of Sciences in St Petersburg, Russia. 6) Texts on the Steps of the Path (Lam Rim) are not studied as a regular part of the geshe course, and are only occasionally taught by visiting lamas of special eminence. Those of us studying at the Rashi Gempil Ling monastery in the US had already received a direct transmission of the mother work for decades, from Khen Rinpoche, who as a young man in Tibet actually attended Pabongka Rinpoche’s own teachings of this text. Those who have not spent many years in a Tibetan monastery might be surprised to learn that the study of the five subjects mentioned above is so absolutely time-consuming and exhausting (basically all day and much of the night for several decades) that most monks never have time to read or study the original sutras taught by the Buddha himself, or more than a few of the original Indian commentaries upon them; and this study is not a part of the geshe program. In fact, early on when I was attending Sera Mey there was no copy at all of the Tengyur (about 3500 early Indian titles of Buddhism in Tibetan translation) in the entire monastery, or in any other of the Great Three monasteries. With great difficulty, and after years of effort, I was able to have an entire new set printed from blocks that were 300 years old in Tibet, and have these 210 huge volumes shipped to India. They now reside in our monastery library. At any rate, I have always felt that some study of the original sutras and commentaries would be good for geshes, and I personally undertook extra work in this area. In the late 70s I helped edit and prepare for printing a translation by Khen Rinpoche and one of his senior students of The Letter to a Friend (Suhirllekha), an important text by Master Nagarjuna, from the 3rdcentury; along with a rare commentary by Jetsun Rendawa Shunnu Lodru (1349-1412), a teacher and student of Je Tsongkapa. I later helped recover rare original commentaries by Chone Lama Drakpa Shedrup (1675-1748) upon the Diamond Cutter Sutra (Vajrachedika)and the Heart Sutra (Prajnaparamita Hirdaya), and have completed translations of these commentaries and taught them to my own students. I have memorized the latter sutra in Chinese and have taught it widely (through a translator) among Chinese speakers in Singapore and Taiwan. I completed, with Khen Rinpoche, an entire bilingual book on the avadana or life story from the sutras of King Udrayana, which explains how the famous Wheel of Life was first painted. I also undertook a study of the Sutra of the Golden Light (Suvarna Prabha), which for six or seven centuries has been very popular in Mongolia, and later actually taught this text to the Mongolian public in the country’s largest arena at the time, in a program televised nationally. Later I founded the Asian Classics Input Project (ACIP),and we began searching the world for textbooks from our monastery that had made it out of Tibet in previous centuries. We were successful in these efforts, and began a program to reprint our monastery’s textbooks off of personal computers. My friend Steve Bruzgulis and I invented the world’s first Tibetan word processor, called TTPS (Tibetan Text Processing System), for this purpose. 1) The Supplementary Texts of the Perfection of Wisdom. During the study of the Perfection of Wisdom in the geshe program, five surkul or extracted subjects are covered; that is, topics which are presented only in a few lines of Master Asanga’s original root text and which must be expanded upon in separate commentaries. There are two commentaries for each of these five subjects: an Overview and an Analysis, although the distinction between the two often blurs over the centuries. The five subjects here are Dependent Origination (which includes the study of the famous Wheel of Life); Foundation Consciousness (Tenets of the Mind-Only School); The Twenty Permutations of Realization; The Art of Interpretation; and The Levels of Meditation—Concentration and Form Realms. Many of these texts had been completely missing; I found all 10 of them around the globe, organized their input, edited them, fundraised for the publishing costs, and arranged for printing and binding. We then provided free copies to all the monks in the geshe program, which was an incredible coup. Obviously during this process I had an excuse to bug the best geshes in the monastery to teach me these subjects in detail, which was another coup! 2) A Commentary to the Collected Topics of Rato. One day a monk from another monastery walked into the computer center which I had built at Sera Mey; he was carrying an ancient manuscript which he thought we would really like to preserve. This turned out to be an extremely rare commentary to the Collected Topics of Rato, which itself is the famed grandmother of this genre of literature (on logic and perceptual theory) in Tibet. We typed both in, and I edited the text with the help of the head of Rato Monastery and the abbot of Trashi Hlunpo Monastery—Gen Supa—who was one of the greatest logicians and tantric masters of the 20th century. 3) The teacher of my greatest scripture teacher in the monastery was Geshe Yeshe Wangchuk (1928-1997), who stayed behind in Tibet and became prominent in the religious affairs committee under the Chinese government. He spent many years writingThe Jewel of the True Thought, which I believe is the most thorough treatment of Master Dharmakirti’s Commentary on Valid Perception to be composed in the last few centuries—it is a landmark work on an extremely difficult subject. Geshe Wangchuk was able to visit Sera Mey in India, and I was honored to work with him, and to oversee the input and editing of the first edition of his work, in two volumes. 4) Towards the mid 90’s, I was working long hours in New York to raise funds for the refugees; continuing Khen Rinpoche’s classes in the evening; and then working into the wee hours on editing the monastery’s textbooks. It was wearing me out badly (Rinpoche here added to my nicknames the one Jati Mik, or Chicken Eyes, because they were bloodshot all the time); and Khen Rinpoche finally made an announcement to the assembled monks at Sera Mey that I was no longer allowed to take on new editing work. I began turning the job over to the next generation, and together we completed the publication of an important text on emptiness, An Overview of the Middle Way, by Kedrup Tenpa Dargye (1493-1568). Although in my opinion the younger monks never achieved the quality of textual scholarship we had reached up to this point, they made good efforts and continued on to publish a large number of additional textbooks in the following years. 5) Perhaps the most important text that I ever recovered and edited for the Sera Mey Textbook Series was The Great Book on the Steps of the Teaching, or Tenrim Chenmo. This huge volume was composed by Geshe Drolungpa Lodru Jungne (c. 1100). It is an extraordinary prototype for one of the greatest books ever written in Tibet: The Great Book on the Steps of the Path, by Je Tsongkapa himself. Geshe Drolungpa’s text had been missing since the fall of Tibet in 1959. During the winter debates at Ganden Monastery, I had the honor of staying in the residence of Kyabje Trijang Rinpoche, one of the two tutors of His Holiness the Dalai Lama. Rinpoche himself had passed away in 1981, and his reincarnation was a precocious teenager by the time I arrived. I knew that the original Rinpoche had been a voracious book collector and one day asked to see the handwritten catalog of his collection. I discovered that, unbeknownst to the entire Tibetan community, there was sitting in his residence a copy of the Great Book. I got permission to make a photocopy, and later was gifted another xerox of a copy discovered by the great Tibetologist Gene Smith. I later found several full and partial copies of the work among the collection of rare Tibetan manuscripts at both the University of St. Petersburg and the library of the Russian Academy of Sciences across the river. And so I was able to piece together a complete edition and supply it for inputting at our monastery. Unfortunately I was unable to edit the work personally before publication and it needs some more proofreading to be perfect, but still the finished book was an invaluable treasure for the world. Having to go through these and other textbooks carefully, word for word, with some of the greatest geshes of modern history to help me when I had questions was a tremendous boost to my geshe studies. As mentioned above, I founded—in 1987—the Asian Classics Input Project (ACIP), in order to train and pay Tibetan refugees to preserve their own sacred literature in digital format. This year marks the 25th anniversary of this effort. Here’s how it started. I had been studying Sanskrit at Princeton with Prof. Atkins, and he began working with David Packard Jr, a Greek scholar from Harvard and son of one of the owners of Hewlett Packard Computer. They were working on a new computer technology called a CD-ROM, and were using it to help input the entire corpus of Greek literature in the world on these disks. This effort was known as the Thesaurus Linguae Graecae (TLG). The actual input was split between the Phillipines and Korea; I watched searches being done of the database in the basement of Pyne Hall, where Classics and Slavic Languages were housed, and immediately had a vision: all of the tens of thousands of ancient Tibetan manuscripts available for everyone in the world, and searchable in a few seconds. I tried all kinds of ways to get a proposal for this to Dr. Packard, but in the end it had to be handed to his wife through the kitchen window of their house by a librarian friend of mine. He agreed to give me five minutes of his time; I went to the meeting with a suitcase full of Tibetan woodblock scriptures. After the five minutes he cancelled all his appointments for the rest of the day and we sat and talked; then he offered us $25,000 for a computer center at the monastery. ACIP was born. I journeyed to Korea to study Dr. Packard’s input methods, then continued on to Bangkok to observe a similar project going at Mahidol University for the input of the Thai version of the Theravadin Buddhist canon, under the auspices of His Majesty the King, who had enough money to hire zillions of legal secretaries to do the work. I engaged a crew of cheaper Thai typists and then flew to Bangalore, the closest large city to our monastery in India. I invited the abbot and board of directors of the monastery to two days of talks at a hotel and pitched the project to them. I made a big deal about how the Thais were ready to do all the work if the monastery didn’t want to, and I think that sealed the proposal. I was given 10 of the biggest young goofballs in the monastery (dropouts from the geshe program); a small room on the edge of the cornfields; and an ancient dragon of a diesel generator for the long gaps in the local electric supply. The rest is history. We have finished digitizing many thousands of ancient Tibetan and Sanskrit manuscripts in centers throughout India. I took a crew of three of the worst of the goofballs (one who was missing a finger) to Russia in the 90’s and hammered out collaborations with the Russian Academy of Sciences and the University of St Petersburg to catalog their collections of rare texts collected for the Tsar by explorers to Tibet over the last 300 years. Chain-smoking ex-military captain Lev Serafimovich Savitsky and I, with two young devoted Tibetans who became fluent in Russian, ran the operation for 14 years. We completed a computerized catalog of more than 130,000 manuscripts, unprecedented in the history of Asian scholarship. A similar project at the National Library of Mongolia has been going on for over 10 years, and isn’t even close to finished. In late 1989, the US Library of Congress asked me to help design their purchasing program for classical Tibetan literature, and our team completed a catalog of all available Tibetan texts in over 100 locations in India, Bhutan, Nepal, and Sikkim. Every time a text was input, it was my job to read it quickly to determine the subject matter, so that we could catalog it on the correct digital “shelf.” This gave me a unique edge on the geshe debate ground, and for the last few Winter Debates I attended, the ACIP database was our monastery’s secret weapon in the scriptural warfare. I was careful to schedule my work and my service of Khen Rinpoche carefully, so that I wouldn’t be stuck in the monastery during one of the “dead” periods. You see, the schedule of classes in a Tibetan monastery is extremely fluid. Students in the same class (say 10th or 11th year class) have different teachers for the same subject. In theory, members of the same class are studying the same sections of the monastic textbooks, so they can have a coherent debate together in the evening. But there are some 12 Houses in Sera Mey Monastery, monastic subgroups that roughly accord to the area of Tibet where a monk comes from. My house was Gyalrong, famous for being the home of Pabongka Rinpoche himself, and which in my day housed about 50 monks. A big house like Pomra might have 200 monks at the same time, while tiny houses had only a handful of monks. You were pretty much expected to study each subject with a teacher from your own house; there are fairly strict “green lines” around the monastery that you need to know about, if you’re going to survive there. Anyway, Khen Rinpoche came up with a brilliant way of allowing me to study with the best geshes of every house. He said I needed a squat toilet (other monks just walked out into the cornfields in those days—minefields surrounding the entire monastery), and had to stay in one of the tiny rooms in the central complex of the monastery. This made my allegiance more neutral and allowed me to study with the stars of each house, for many years. I was also one of the only monks who knew where other monks in my class had reached in their own particular house’s study of our topic for the month. There’s no special schedule for most events at the monastery. There’s a big gong up on top of the main temple that you can hear maybe a half mile away; when they bang on it, you’re supposed to run outside and try to figure out what’s going on. If your scripture teacher decides to take a month off and visit his cousin at Drepung, then you drop a month behind in the geshe course and are clueless in the debate ground. If he decides to skip ahead to another subject, none of your classmates with other teachers has any idea what you are debating about. One year I took a month off of work and spent all my air ticket money for the Winter Debates, and a few weeks before leaving they were suddenly moved to northern India, and I couldn’t attend. If somebody like the Dalai Lama decides to give a teaching a thousand miles away, all the monks take off on a pile of buses for a month and there are no classes at all. If a rich Tibetan merchant shows up with no notice and asks for a three-day prayer for his sick mother-in-law, again all classes are cancelled and all monks are expected to attend. And so I had the constant challenge of trying to be with Khen Rinpoche in America, or with my scripture teachers in India, whenever the best debates or classes were going on in each place. Trying to predict when exams would be held required considerable voodoo; when I was back home in the US, my Kyorpun, or Class Leader, kept me up on sudden changes. I worked it out pretty well because, luckily, the diamonds that my firm in New York needed to buy came mostly from Mumbai—I could take off on a buying trip and be on the debate ground in less than a day after any program was announced. Being careful not to exaggerate, I would estimate that I spent about an additional 5,000 hours in classes, on the debate ground, and editing the geshe textbooks during this time. I never really intended to become a geshe; I just wanted to learn everything I could, and one day my Kyorpun walked in and told me I was now eligible for the preliminary exams, which take place 3 or 4 years before the geshe exam. The field at this point is winnowed down to about 12 monks in each class who are considered good enough to try for a geshe. The tradition of selecting these 12 is a harrowing experience. The monastery abbot and board of senior teachers meet in secret to decide the candidates. The giku (a corruption of geku) or debate master is functionally the vice-abbot of the monastery; at that time, it was Geshe Tenzin Sherab. He writes down on 12 small slips of paper the names of 12 different difficult subjects for the pre-geshe exam, which is called the Rikchung. And then one morning he saunters into the debate ground and begins strolling around. Most of the monks who are in the geshe course (about 300 or 400 in my time) have figured out that he’s going to be handing out the slips to the lucky 12 on that day. It’s considered very bad luck to make eye contact with the debate master at this point—impossibly, you have to focus on your debate at the moment. He will come over close to you and you can glimpse the slip of paper in his hand…he pauses…and then he spins around in a circle and hands it to someone else. It’s seen as an exercise in not getting your hopes up, because a geshe degree is the most important thing in the world to a young Tibetan monk. Anyway, I was offered a slip and given the subject of bodhichitta, or universal love. This is considered one of the choicest subjects and I made a formal request to the monastery that I be downgraded to the lowest subject, which is known as “The Scripture of Maitreya,” so there would be no question of favoritism. Khen Rinpoche was abbot at this time, and I held a high position called Sulpun, or personal attendant to the abbot—something like Lord Chamberlain of the monastery, certainly the first foreigner in history to do so. At any rate, Khen Rinpoche steadfastly refused to attend any program where I was debating or being examined, and over the length of his life refused to help me practice debate—we were both uncomfortable with the thought of my confronting my teacher in this way. He wanted me to want it badly enough to do it on my own. The particular subject I ended up with, by the way, is an important discussion about the distinction between the open teachings and the secret teachings: is Maitreya, the future Buddha, already a Buddha? The Rikchung Examination is a fascinating event (terrifying for me at that time). The 12 candidates are divided into 6 pairs of debaters, each pair covering the same subject—one attacking, one defending, and then switching. You order a huge scroll of Tibetan paper from traditional paper makers, and then carefully write a flow chart of your entire debate in tiny Tibetan letters. This is actually just a logic program, like the one any computer would use. If your opponent answers “yes,” continue down the left branch of the debate. If he answers “no,” go down the right branch. All possible moves are memorized ahead of time, an extraordinary exercise similar to trying to plan ahead every possible move in a chess game. With the first word that your opponent utters, half of your logic tree, and half of your memorization effort, become irrelevant. After you finish writing the scroll, you tack it up on the inside of the door to your monk’s cell, and stand there for hours every day memorizing it, months ahead of time. And of course you always lock your door whenever you’re not at home! These scrolls are kept as tightly as any NFL game plan, and there really are Dharma Spies roaming around the monastery before any major debate. So anyway I wrote my own scroll and memorized it. The format of the Rikchung Examination is that all of the monks in the monastery are already seated cross-legged on the floor the main assembly hall. You and your opponent enter the huge wooden doors and walk very slowly, say a step every minute or so, up two separate aisles cleared on two sides of the hall. On the way up you yell at him pieces of your scroll, over everybody’s head,and he tries to give logical answers. On the way back out the roles reverse. I’d say I won the debate, but I’m sure my opponent thought he did too. One of the debate masters started calling me Mr. Pic-Pic after that exam (nicknames are a big part of monastic humor). Pic-pic is the Tibetan word for jello, and he was making fun of how much my legs were shaking under my robes during the walk up and back. Ha ha. Anyway, I made the final cut for the geshe exams, to be held years later. The geshe exams were more fun than the Rikchung and had five components. This was in 1995; a group of my students came with me from New York to watch the examination process, which took me about three weeks. The first component was the preparation, which I did back in New Jersey. This was writing sort of a short “doctoral thesis” in classical Tibetan; my assigned topic for the geshe exam was a subject called “Gone Afar,” which is the name of the seventh bodhisattva level. This is a crucial topic on the question of when the world stops appearing to us as if it comes from its own side. I composed this thesis on my own and then memorized it, in a special ancient melody which Khen Rinpoche taught me, and which was traditional for a geshe examination. Second, at the monastery, I had to sit and defend myself in debates with each of the classes in the debate ground; sort of like having to debate with all the freshmen, then the sophomores, etc. I had many of my western students watching, leaning on the debate ground wall from the outside, and had a lot of fun. Here are some photos as I went through those class challenges. At this point in New York I had also already started the process of creating a “baby geshe” series of 18 courses, translating the cream of the monastic textbooks I had studied, to take westerners through the highlights of the monastic geshe course (these are the 18 Foundation Courses of the Asian Classics Institute, and are free on line at acidharma.org). For me, this process had been an intensive review of the entire geshe course, and it kicked in during these debates against all of the 300 to 400 monks in the debate ground. I knew my stuff and yelled like a tiger. The third step in the geshe examination is called damcha shakpa, meaning a defense in front of all the geshe students at the same time. This was a little more scary, standing alone against any or group among hundreds of debaters who might stand up to attack me, in a huge assembly outdoors under the stars. But I did well, and the founding abbot of the monastery, who had come to observe, stood up and declared that I was worthy to be a geshe. The fourth step is to attend a huge prayer ceremony of the combined monks of both the colleges of Sera, in the central temple of the two monasteries together—with about 3,000 monks in attendance. This is mostly a chance for ones own monastery to show off their new geshe, and thankfully didn’t require any debating, for the level of geshe I was being examined for. There are a variety of geshe levels. The lowest, which is still extremely difficult and only reached by a few monks each year in each monastery, is called lingse geshe. The most famous lingse geshe of all time was Pabongka Rinpoche himself, author of one of the greatest texts of Tibet—A Gift of Liberation, Thrust into Our Hands (a title sometimes shortened in English to Liberation in Our Hands). The word lingse means “within ones own monastery,” meaning that the candidate does not have to be examined in all six of the Gelukpa colleges of the Big Three monasteries. This is the kind of geshe degree which I was awarded. The highest degree of geshe is the hlarampa, which for me would have required another 5 to 7 years in the monastery, waiting for an opening in the backlog of hlarampa candidates at the time—as only two a year were permitted for each college. I had watched many of my friends in higher classes sitting around the monastery trying to keep up their skills for years, waiting for such an opening. I was already teaching nearly 100 students in America, and I thought they would be hurt by such a delay, and didn’t think that waiting for a hlarampa degree would increase my knowledge or my ability to help them. The fifth and final step was to defend myself before the entire assembled monastery; this means that all the senior geshes and teachers in the monastery—who no longer attend the daily debates in the debate ground with the geshe students—would get their chance to challenge me, and see if I knew my stuff. Any other monk in the monastery—about 1,300 monks in my time—could also stand and try to trip me up. There were even monks affiliated with our monastery who travelled over a thousand miles from other parts of India because they heard that a westerner was trying to pass a geshe exam, and wanted to challenge me. Before this warfare began, I was supposed to sit and recite my geshe thesis from memory. I have a photo of myself going into the assembly at that moment; look how nervous he looks! I sat down among the endless rows of monks, a microphone was placed before me, and suddenly I couldn’t remember a thing. Then by chance I looked into the eyes of the monk in the row opposite me. This particular monk was a devoted young lama who is believed to be the reincarnation of Jangchub Bumpa, the monk who founded Sera Mey Monastery some six centuries before. He looked into my eyes and closed his own, and then I closed mine, and I felt as though he was filling me up with the power to pass the examination. I started to recite my thesis; my stepmother—who had visited the monastery in the beginning, on the day I was made a monk—was present on this final day, listening from the balcony above. She said that the chanting was otherworldly beautiful, and I have always felt it was all the Rinpoche’s blessing. This then is the story of how I became a geshe, starting in 1974 and finishing in 1995, with additional studies into the 2000’s. Given that it’s so easy with webcams nowadays, I would be happy at any time to help anyone who has a question about any of the many subjects covered in the geshe course. I currently teach 10-day programs four times a year in my home state of Arizona, and I would be thrilled at that time to give an exposition of any geshe topic, or to debate it in English or Tibetan, live on camera with any interested person around the world. One last thing to say about the geshe studies; and maybe it’s the most important thing. Sometimes I just sit there and wonder why I ended up in this little strip-mall town in New Jersey; why just about all of the high geshes in America happened to be sitting there when I arrived there at age 22; why they had fled from Tibet at exactly that particular time; why the best books and teachers in the monastery kept showing up just when I needed them, and so on and so on. It seems that fate, or karma, had a lot to do with my being able to finish a geshe degree, and I think about that a lot. Because a big part of the geshe program doesn’t have to do with books and debates at all. I watched a lot of incredibly good scholars and debaters, people I could hardly keep up with, rise and disappear in our class—die, leave the monastery, lose interest—as we passed through the years. And in the end I came to realize that the survivors were those who were doing something more than just studying: they were serving. In my case, this meant 25 years of really total service. My main Tibetan teacher, Khen Rinpoche, was incredibly demanding. He always taught for free, thousands and thousands of hours over a 30-year stay in the United States, but he expected his close students to follow the old way. I cooked and washed the dishes every day for 8 years in the monastery kitchen; I did all his laundry; I drove him wherever he needed to go. I mowed the lawn, watered the flowers, cleaned the toilets, and spent two years digging up a huge oak tree trunk by hand because he told me to. I built a lot of the house that he lived in with my own hands, which were actually permanently damaged during that time. And I paid for most of it, with some money I had inherited from my mom when she died. I took him to his doctor appointments, typed out all his correspondence, edited almost all of his books and got them printed, did his taxes and made sure he got his social security. I scheduled most of his appointments, and tried to make sure that no one failed to see him when they needed. I did the accounts for his organizations, a job I really didn’t like, and made sure he never saw a lot of his bills. I went out and got a very difficult job for over 15 years and made sure he never even knew about a lot of the bills he got in the mail, or the real cost of his groceries. And he made me serve the places where I learned as well. He had me up painting steeples hanging from incredibly high scaffolds; we laid the sidewalks together, dug the cesspools, built new monks’ quarters and donated them to the Mongolian temple. At the monastery in India he had me slaving from early in the morning into the wee hours of the night. When I made my first trip to the monastery for my ordination, the monks were drinking out of a filthy stream that ran across the monastery cornfields, and almost everyone was sick all the time with dysentery—especially myself. 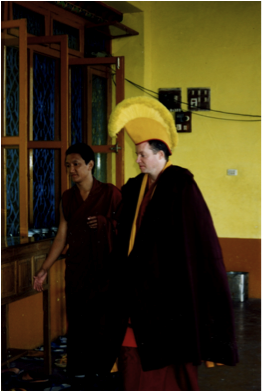 Lama encouraged me to scour the refugee aid agencies in New York, and I designed and built the first wells and water lines serving every house in the monastery. Almost all the young monks when I first got to the monastery were suffering from malnutrition, and had open sores covering their faces and heads. My Lama and I spent over 20 years building up the Sera Mey Food Fund, which in time paid for the food expenses of over a thousand monks, with special nutrition programs for the youngest monks. Tibetan monks are terrible with accounts and investing money and we had several close calls. One day the monastery got in very serious financial trouble, and it looked like they would actually have to close down and send everybody home—the temple and buildings would be auctioned off and converted into homes for laypeople. I worked out a debt repayment plan that involved me giving up every penny I had ever made at the time; and so my Lama and myself, and one other student of his, saved our monastery. I built and started a diamond-cutting factory in the monastery, working almost until dawn every night to get it going, and donating it to the monastery so they could support themselves. I worked in the cornfields behind water buffalo dragging an old log plow, my Irishman skin burnt to a crisp in the Indian sun. I got the monastery international aid grants to inter-plant soy among the rows of corn to keep the crop going, and helped start a tofu factory to use the soy to try to get the monks off of meat. There are also several ways that monks in the geshe program in general are required to serve the monastery, even beyond what their own teacher demands of them. In my day, when your class finished the first 12 years in Perfection of Wisdom and was about to go on to Middle Way, the entire class was expected to take several months off of their studies and go begging for funds to help the monastery throughout all the Tibetan refugee camps in India—the idea being that the karma you got from this hardship would help you crack the idea of emptiness. At my suggestion, my class chose as our giftto work to build a library for the monastery—something that had not existed up until then. We bought thousands of Tibetan scriptures, and tables and chairs, and renovated part of a nice quiet building. It was the first time everyone could go and use the books they needed for their studies, even if they were too poor to purchase them. If it rained—as it does straight for several months in the monsoon season—we would be required to stand in the rain and keep debating until the debate master (who might be having a cup of tea at home, oblivious to the rainstorm) came and released us. A lot of the monks had tuberculosis, and some good ones around me died from it after continual soakings in the debate ground. And so for my geshe gift I worked for several years to build a covered pavilion and park for debating which would accommodate about 500 monks. This came out very nice and has since been used as a model by all the other great Gelukpa monasteries. I’m not saying all these things to boast about myself. What I’m saying is that I was brought up by a Lama who demanded that you go beyond yourself in your student years—that service and scholarship belong together, that “geshe” is not just a title, it’s a way of life. And I am very proud to be a product of that kind of thinking, even though it was so difficult for me, for so many years. To me, a geshe is all of these things. And I think that serving others is the only way to make enough karma to become a geshe. I hope that this piece addresses some of the questions of my friends, and I will be moving on to other topics in upcoming essays. The next one will describe my idea about teaching the subjects of Buddhism, and how I have done so myself; then I’ll be moving on to my ideas about practicing these teachings in modern times. 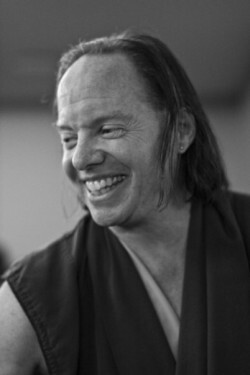 Geshe Michael Roach graduated with honors from Princeton University and is a recipient of the Presidential Scholar Medallion from the President of the United States at the White House. He is the first westerner to be awarded the degree of Geshe, or Master of Buddhism, in the 600 year history of Sera Mey Tibetan Monastery, after more than 20 years of study. He is one of the founders of New York’s Andin International Diamond Corporation, which reached $250 million in annual sales and was sold in 2009 to Warren Buffett; he has used his income from the company to support Tibetan refugees for 25 years. He is the founder of the Asian Classics Input Project, which for over two decades has trained and employed Tibetan refugees to preserve their ancient spiritual literature digitally, with thousands of texts available for free online at asianclassics.org. He has translated more than 20,000 pages of these texts for the Asian Classics Institute, also available free online at acidharma.org. He is the founder and spiritual director of Diamond Mountain University and Retreat Center, with a 960-acre campus in the southwestern USA. He is the author of numerous works including the international bestseller, The Diamond Cutter, currently available in 25 languages. He is the founder and chairman of the Diamond Cutter Institute, a business management and personal development company which has supplied educational seminars to over 10,000 people in more than 30 cities around the world since 2009. Friendship Essay: Where Would I be Without Friends?